The Compact Elite - G & W Machinery Sales, Inc. The Compact Elite™ can accommodate a 25.5" x 25.5" part size, while remaining a bench top model. And like The Compact™ comes standard with a true 20 watt fiber. 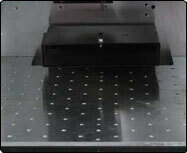 The FiberCab series possess a reliability that is unmatched by any other kind of solid state or gas laser system. Offering a wide operating wavelength, high stability and ultra-long diode lifetime complete an impressive list of advantages. The FiberCab series utilizes state of the art solid state Ytterbium fiber laser systems of near infrared spectral range (1060-1080nm) and Green wavelengths (532nm). The FiberCab series offers laser power options from 10 to 200 watts and with a unique combination of high peak power, ideal beam quality, fiber delivery and the highest wall-plug efficiency. The FiberCab Series Equipment is safe, compact, and service-free, designed to meet individual marking needs with the ability to mark a wide variety of materials including Direct Part Marking (DPM) of alphanumeric, logos, serial numbers, part numbers, lot and date codes, schematics, graphics, deep engraving and more. It can be delivered as a stand-alone system that can be integrated into any production line or a full turnkey workstation. The Fibercab series fiber laser system offers a host of standard features and can easily be equiped with many advanced optional assesories. • Standard 160 F-Theta lens and others available to increase marking field.